What you need to know about charitable contributions. Ten rules for cultivating an unselfish church. It pays to get tough on contributions. How to make donations flow from new sources. Use this example for your church, or create your own. Quick tips and recommended resources. Every church strives to cultivate generous givers. At the same time, church leaders need to know principles of legal giving and receiving to safeguard the coffers, as well as the church’s reputation. For instance, if one of your members decides she wants to surprise your pastor with a monetary gift this Christmas, and she wants to benefit from a tax write-off at the same time, she’s making what the IRS would call an illegal contribution. Our government frowns on people funneling money to a particular person in the church’s name just for the benefit of tax-savings. In simple terms, when people make a charitable contribution, they give up control of the offering and let the church manage the donation. 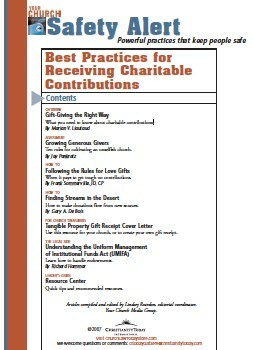 This download is designed to provide you practical help and clear understanding on some of the issues surrounding charitable contributions.